This observational documentary follows a year in the lives of two inspirational teachers in the only primary-age boarding school in Ireland. Headfort, a school not unlike Hogwarts with its 18th century buildings, secret doors and magical woodlands has been home to John and Amanda Leyden for 46 years and a backdrop to their extraordinary careers.For John, rock music is just another subject alongside Maths, English, Scripture and Latin, all of which are taught in a collaborative and often hilarious fashion. Tucked away in a cellar that's home to the school's two rock bands, John nurtures a special kind of youth revolution that teaches responsibility and independence in equal measure, wrapped up in heavy metal or pop or, as he tells the kids, they can play whatever they want, as it's their space. "It certainly succeeds in being a joyous, humane look at the role that school, education, and, most importantly, teachers have in the lives of such malleable minds. " 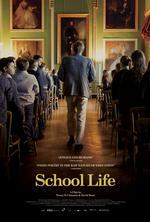 ""School Life" is as charming, intimate and warm-hearted an observational documentary as you'd ever want to see." "By highlighting sweet, indicative, or hilarious moments rather than tracing the teachers’ relationships with any particular students, the film is more attuned to the rhythms of Headfort than it is the people in it." "A rambunctious collage of a self-contained self-sustaining world, with its own rules of play and concerns."